Titan by name, titan by nature and in classic army green both looks and feels like it means business. 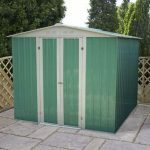 A solid design and constructed out of PVC coated galvanised steel, this shed is both weather resistant, fire resistant and maintenance free. If you want a no-frills shed that will do its job of protecting your items from harm then the Trimetals Titan 960 could be the one for you. The Trimetals Titan 960 is a premium, neat, secure storage solution suitable for any garden. Complete with wide lockable double doors gives you easy access to your garden equipment and with enough interior space to store plenty of items it will be a welcome addition to your outdoor space. It is rustproof and weatherproof and built to last. 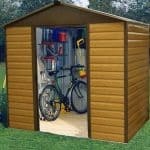 Please note that these sheds must be bolted to a flat and level concrete base. If you want a shed that will blend into your garden then this is not the shed for you as this is a shed that was designed to stand out. In army green, its windowless design looks like it means serious business when it comes to protecting your items inside. With its simple design the Trimetals Titan shed is built to last for many years to come. 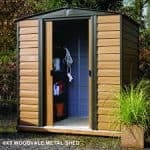 With a massive 25 year panel guarantee this could be a shed for life, making it a sound investment for your garden. At this price point we can understand why customers want to get to know the Trimetals Titan inside and out before making a commitment to purchase. At whatshed.co.uk we want to help you ensure that you make an informed decision when choosing the right shed for your needs. Below we identify and discuss the sheds many features and ways it could fit into your lifestyle. Exterior: The no-fuss, simple exterior is for those seeking the ultimate design in a practical storage shed. The PVC galvanised steel exterior combined with a 25-year panel guarantee prove that this is a shed that will truly last and last for many years to come, serving its purpose within your garden. Interior: The windowless design is a nod to the security aspect of the shed design. Although dark when not in use, the interior soon floods with light when the double doors open. Additional storage such as freestanding shelving can help use this shed to its ultimate potential and provide a neat and organised solution for your items all year round. Doors: The large, wide doors cover the entire front façade of the shed. With a good width when open, these are a feature that allows you to take things in and out of your shed as you wish, even on a daily basis. Security: The Trimetals Titan comes complete with a secure locking mechanism, giving you peace of mind that your items are completely safe when not in use. 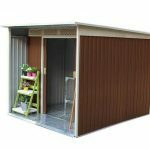 The Trimetals Titan 960 Metal Garden Shed: How easy to build? We recommend that you find a partner to tackle assembly of the Trimetals Titan with you due to the size and weight of the metal panels and roofing. Assembly is straight forward, even for the DIY novice, and a full instruction booklet is provided. A detailed step by step guide will keep you going in the right direction, whilst easy-to-follow diagrams are invaluable for clarification. All the panels, roofing, fixtures and fittings will be supplied as standard within your package. We expect that this particular shed will be standing in your garden and ready for storage within a day. 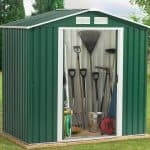 The Trimetals Titan 960 Metal Garden Shed: What is the overall quality like? Trimetals are Europe’s leading manufacturer of secure metal storage, ranging from garden sheds to motorbike storage. 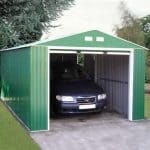 They provide both specialised and general storage for vehicles and equipment. All the materials used in the construction of their products is sourced from the UK and is of the highest quality, coming with a 25 year panel guarantee – the best and longest guarantee that we’ve seen so far. With a feature pent roof, water collecting at any point within the shed exterior is not an issue. Ventilation also prevents issues such as rust, rot, damp and mould, keeping your items fresh, dry and secure. With no maintenance required, to keep up the sheds smart appearance simply hose down with water or sponge wipe with a soapy solution for extra cleanliness and sparkle. Wow- you wouldn’t want to mess with the Trimetals Titan shed. 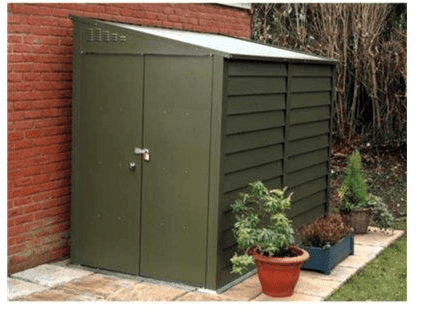 This fantastically strong and durable model could suit a range of uses within your garden, from being used for outdoor and garden equipment storage to bike storage, this heavy duty shed will withstand even the roughest treatment over the years. At this price point it may be a daunting prospect for most, however with a 25 year panel guarantee it is obvious that Trimetals has confidence in the quality of its products.